It's now the 11th year that the Jobs With Justice organization has held their annual 'Scrooge of the Year' award. Nominations are now open for 2010. In light of the upcoming holiday season you are invited to nominate the most repulsive member of the ruling class in the past year. Here's the notice from the AFL-CIO Blog. It’s the holiday season and time once again to say “bah humbug” to the most cold-hearted and greedy CEOs, corporations and politicians who exemplify the spirit of Ebenezer Scrooge. This is the 11th year that Jobs with Justice (JwJ) will “honor” the person or group that has done the most to “scrooge” workers. And the floor is open for nominations. 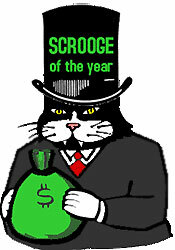 Beginning today, you can nominate your candidate for Scrooge of the Year, along with a brief description of why he or she deserves the award by clicking here. The winner will join an infamous group. Last year’s winner was the Chamber of Commerce. Voters singled out the Chamber for its narrow, radical agenda advocating anti-worker, profit-focused solutions to the broken health care, labor and environmental systems. In 2008, voters picked the entire lot of Wall Street executives whose unchecked corporate greed led to our nation’s economic disaster.